Time: the 1950s. Kataragama was then a sparsely populated pilgrimage outpost. The road from the nearest town, Tissamaharama, was then untarred, rutty and uneven. There was no police station or commercial centre as found today, except during the July festival when crowds thronged, mostly Tamils from the North or the upcountry tea estates. Swami Gauribala (better known as German Swami) was seated upon a deck chair, puffing his favorite Jaffna 'manilla'. I was seated there upon another chair in the open verandah of the late Alwis Appu's tea boutique not far from the Mahadevale gate. A swarthy man walked in. Nervously he approached Swami, sat down on a bench and spoke: "Swami, if God Kataragama has two wives, can't we also do the same?" Swami Gauribala looked at him, gave me a wink and asked, "Why do you ask this?" The man fidgeted a while, plucked up courage and replied, "I am married and also have a mistress. My wife has come to know this and there is hell at home!" Swami laughed heartily before looking serious as he replied, "Yes, you could. After all, if gods can  and they are supposed to have made man  why not man? Certainly you can. No harm. But don't exceed two!" In another incident at the same venue  German Swami's favorite spot to inhale the deadly fumes together with a cuppa tea  another poor soul queried Swami, perplexed as to why there was so much evil in the world. Swami Gauribala inquired of his religion and the inquirer said he was a Christian. Then Swami asked, "Who created this troublesome world?" Well, God is said to have done so." The work of God is all-perfect," the man replied, good Christian that he was. To which Swami retorted, "Then why do you see imperfection in this mysterious being God, in Whom you believe?" At another time, a pilgrim cornered him and sought his advice to pay off a vow. "Swami, last time I came here, I made a vow in return for a favour. It was granted and I want to give one hundred rupees (which was a princely amount those days). How best should I do it? Give it in a puja or to a beggar?" Swami pointed to the fire pit alit with burning camphor and said, "Throw the note into the fire!" The man was aghast, and replied, "How could I do it? This is money!" Swami explained saying that the devotee's vow was to give to God Kataragama in gratitude and not to gain merit for himself by doing it for punniyam (spiritual merit). Years later, we were at Alwis Appu's tea shop when a man accosted us and asked German Swami whether he could remember him. Swami looked hard at his face and shook his head. After much thought, I did just what you asked me to do. And today I am here again, happy because I became very prosperous after that!" Swami hinted at the mental conflict the poor man must have had before he did the act  how enslaved people are by money. Ask anyone to tear up or burn a big note, and see the reaction. Of course, we do sometimes tear up money in anger  other people's money, he said laughingly. Swami's life at Kataragama took a different turn after the arrival of Governor-General Lord Soulbury's son the Hon. James Ramsbotham in Ceylon, who later shocked his illustrious father by opting to reside in Kataragama with Swami Gauribala instead of staying at Queen's House. It was a strange sight to see the two white men in white vettis walking about Kataragama. Soon Ramsbotham came to be known as Soulbury Swami. German Swami Gauribala with other swamis at Kataragama in the late 1950's. The Ramakrishna Mission had a very prominent place and sanctified role in the affairs of the day then, before it was closed and taken over by misguided politicians. Any pilgrim was assured of a resting place and free meals for a maximum period of three days in clean, hygienic and quiet surroundings. Daily at lunchtime a limited number of tickets were issued to the poor locals and beggars who queued up at the gate. The authorities felt highly honoured and privileged to serve Lord Soulbury's son as a sadhu. He was invited to come daily for meals, along with Swami Gauribala and any of their guests. But German Swami at times insisted that Lord Soulbury's son took his place in the queue with him and others for meal tickets. Once or twice I was also invited to join in the fun and everyone was thrilled by the marvel of seeing pure-blooded English aristocracy, bare-bodied and in white waistcloth, mingling with the bedraggled and dirty, true to the Tradition that all are equal at the feet of the unknown and unknowable Divine. Unlike today, the Tamils who mainly frequented then adhered strictly to this custom. All were addressed as swami, meaning literally Your Lordship, the mode of address to their God. All males went bare-bodied above the waist, a gesture symbolic of leaving social distinctions behind and literally baring one's breast in the presence of the deity. It was in sharp contrast to today, when politicians and self-powered people vie with each other with influence and 'big notes' to get themselves served and to attract the attention of the priests first, without taking their turn with the rest. 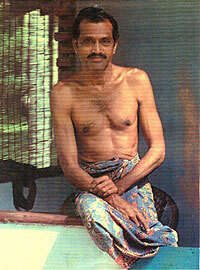 In the late fifties, an incident at Kataragama involving Swami Gauribala and the late Spencer Rajaratnam precipitated a change of place in the life of German Swami who, with the help of Soulbury Swami, shifted to Thondaimanaru Selva Sannidhi Murugan Temple in the Jaffna peninsula, where Soulbury Swami helped to build an ashram for him and where he lived until his demise on May Day, 1984. In the mid-60's the authoress Maggi Lidchi of Aurodindo Ashram wrote a fictional account of one seeker's experience of living in German Swami's ashram, "Summasthan" (Luzac & Co., 1967). Entitled simply Earthman, the story has twice been targeted for production as a feature film but both times the producers failed to secure adequate financing. Earthman may yet appear on the big screen, despite the seemingly endless conflict in present day Sri Lanka.